Catherine Story will host three screenings and informal discussions, focusing on different areas of film which have been influential to her work. Catherine Story will be in conversation with curator and writer Andrew Brighton about humour and melancholy in the work of Keaton and Chaplin and how this has impacted on Story's work. The evening will begin at 6:30pm with screenings of two short comedies, Chaplin’s The Floorwalker (1916), and Keaton’s One Week (1920). In the following discussion, Brighton and Story will also explore the pioneering technical innovations of both filmmakers especially in relation to the sets they designed to complement their balletic performances. One week is 19 minutes. Andrew Brighton was formerly Curator of Public Programme at Tate. He has written widely on art and its institutions, and also on painting, including most recently for the forthcoming Tate Britain exhibition, All Too Human; Bacon, Freud and a Century of Painting Life. He has long been passionate about early cinema and is currently working on a graphic novel with Catherine Brighton, who also wrote and illustrated Keep Your Eye on the Kid: the early years of Buster Keaton (2008). 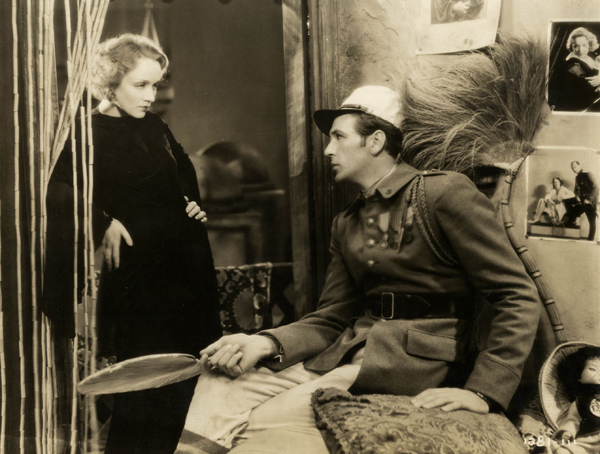 Catherine Story will be in conversation with Professor Laura Mulvey, following a screening of Josef von Sternberg's Morocco (1930) featuring Marlene Dietrich in her first Hollywood appearance. The evening will begin at 6:15pm with a screening of von Sternberg’s classic Morocco (1930), starring Dietrich and Cooper. After a short break, Story and Mulvey will begin an informal discussion at 8:00pm that explores their common interests ranging from lighting design to love, obsession and death in this pre-Code Hollywood film. Morocco is 1 hour and 32 minutes. Laura Mulvey is Professor of Film and Media Studies at Birkbeck, University of London. Her work includes Visual and Other Pleasures (Macmillan 1989), Citizen Kane (Macmillan, 1992), Fetishism and Curiosity (BFI, 1996) and Death Twenty-four Times a Second: Stillness and the Moving Image (Reaktion Books, 2006). As a filmmaker, she made six films with Peter Wollen including Penthesilea (1974) and Riddles of the Sphinx (1977). For this final event, Catherine Story will be in conversation with artist Jonathan Allen. Beginning at 6:30pm, Story and Allen will screen short film clips that feature optical illusions, trickery and magic while discussing how directors such as Charlie Chaplin, Segundo de Chomón and Federico Fellini have influenced their work. The conversation will also include a premiere screening of kinora reels from the collection of the Magic Circle Museum. Jonathan Allen is a London-based artist, writer and curator best known for his work addressing the politics of enchantment and various magics at play within late modernity. His recent book Lost Envoy (Strange Attractor, 2016 & MIT Press, 2017) reactivates a forgotten deck of fortune-telling cards hand-painted in 1906 by Austin Osman Spare. Read Allen's essay on the history of shadow-throwing, Sleight of Light, published in Cabinet's Winter 2006/07 issue here.